This is a 5-night and 6-day workshop. Your adventure begins at 10 a.m. on June 17 and ends after a final slideshow on the afternoon of June 22. $1,750 + applicable taxes. Apply below. Note: Deposit of $500 is required to reserve your spot at the workshop. Balance of $1,250 due on March 19, 2018. Or, you may choose the "Pay in full" ticket if you desire to pay all at once. Last day for a cancellation request is March 18 (see details here). The workshop fee does not include transportation to and from the park, lodging, food or the park admission fee. 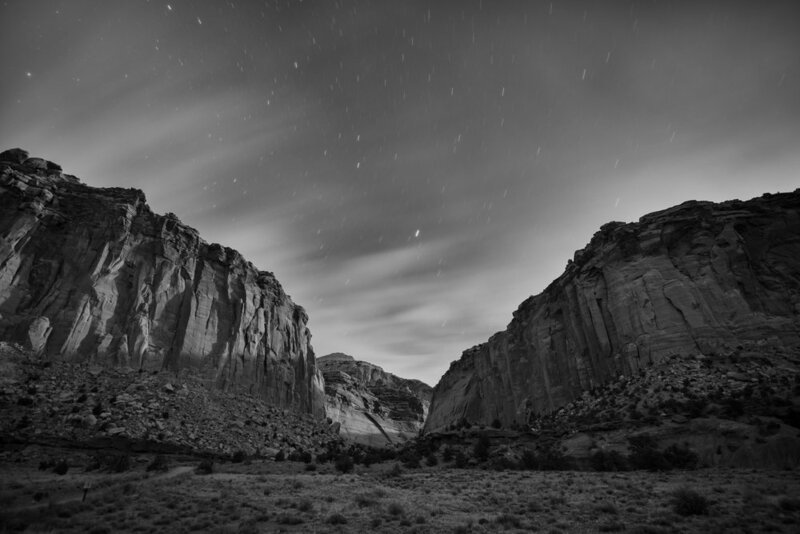 For those who want a special challenge before the workshop, we're offering a Milky Way / Backcountry Camping adventure at the Temples of the Moon and Sun in the park's Cathedral Valley. $650 + applicable taxes. After registration for the main workshop, you'll receive a link to register. First come, first-served. As with all Passport Series workshops, we will teach at this location only once. 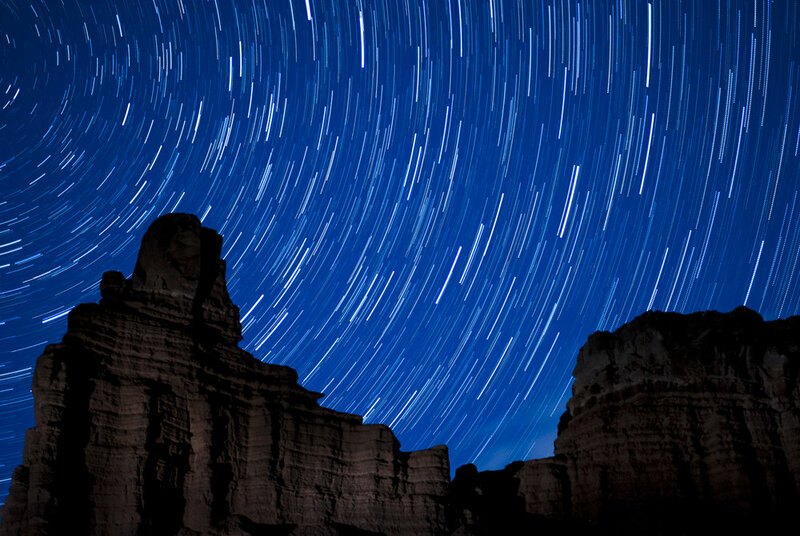 If you have a dream of making epic long exposures at night at Capitol Reef National Park, we hope you join us. 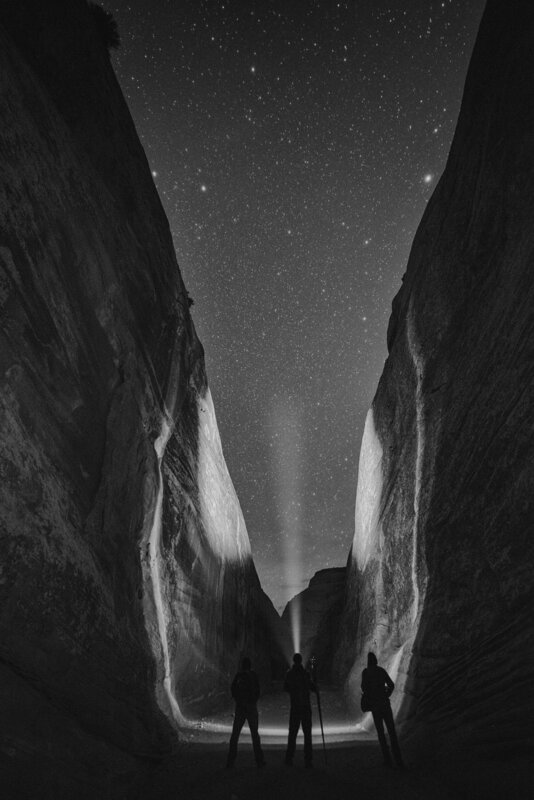 This workshop occurs during the first quarter moon, and will appeal to photographers interested in using gentle moonlight to bring out landscape details with some light painting closer to the camera. 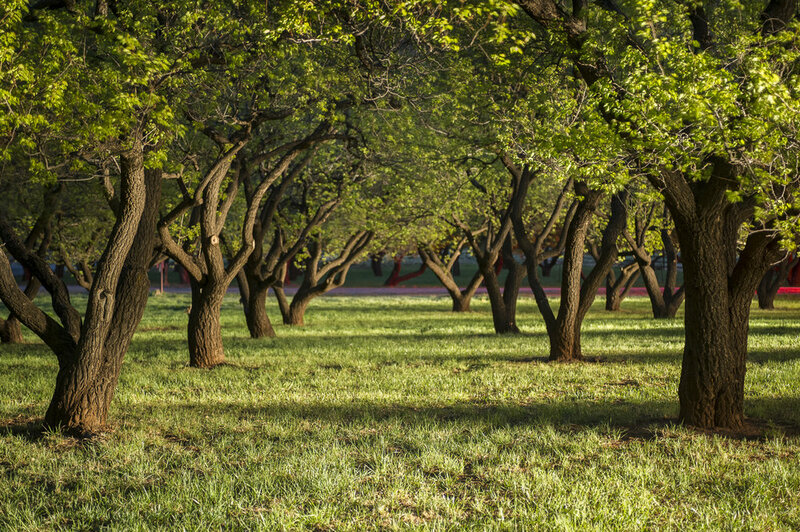 The workshop will explore the orchards of Fruita, the wide open spaces in the Waterpocket District and various other features unique to the park. Our locations are vast, so everyone will be able to spread out and not get in one another’s way. Each participant will have the opportunity to work one-on-one with Matt and Gabe in the field. 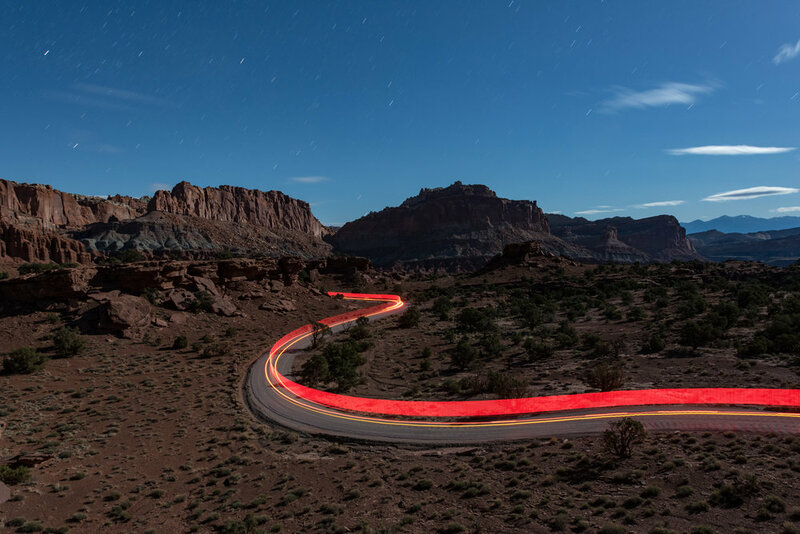 Capitol Reef is a massive park spanning 378 square miles. Much of it is breathtakingly beautiful backcountry. But the road-accessible portions (which we will focus on) have a variety of features including natural bridges, wide open valleys, cliffs, water pockets, gorges and more. The park is well-known for exposing over 10,000 feet of sedimentary strata. Rock hounds and geology buffs will have a field day. We’ll be working along the most scenic route, aside the Fremont River, which contains the white domes of Navajo Sandstone that give the park its “Capitol” name. The “Reef” portion of the name derives from the rocky cliffs that form a natural barrier, much like a coral reef does in the ocean. The oldest rocks are found in the western part of the park, and the younger rocks are found near the eastern boundary. This layer upon layer sequence of sedimentary rock records nearly 200 million years of geologic history. 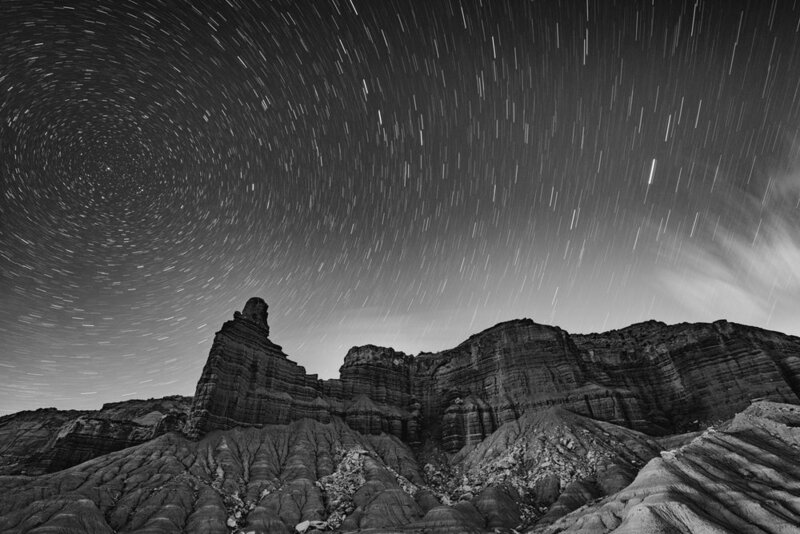 Couple that with ageless stars and you have a magical combination for night photography. This optional add-on is available only to workshop attendees. You'll get a link to optionally purchase a ticket after registering for the main workshop. A couple of days before the workshop begins, we'll take a group of six people up into the Cathedral Valley backcountry for a photo adventure. This requires renting a high-clearance 4x4 car (think Jeep, not Subaru) to navigate the primitive (unmaintained) roads to get to our destination for one night: the Temple of the Moon and the Temple of the Sun rock formations. 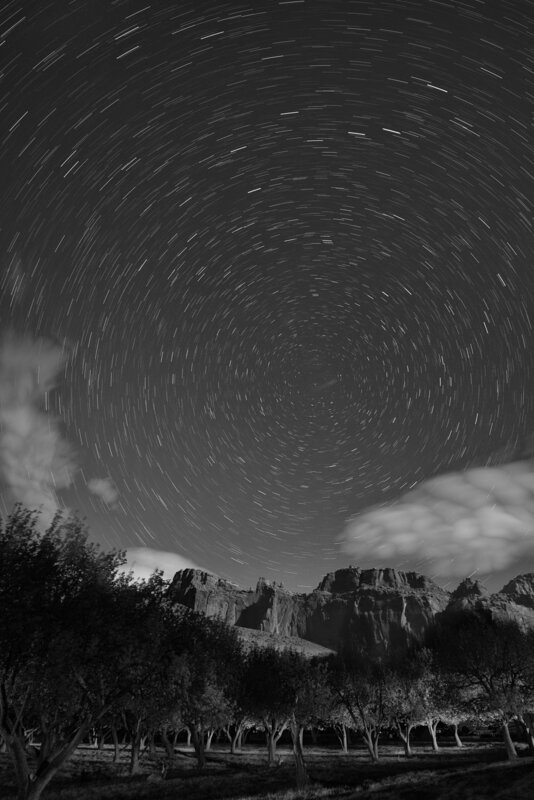 We'll be shooting the Milky Way right after a new moon. Expect to make gorgeous panoramas with gentle light painting on these monoliths rising from the desert floor. After shooting, we'll camp overnight nearby and have a chance to shoot the Temples at sunrise. Then we'll pack up and drive back along Cathedral Road to the hotel and rest up for a day before the workshop. We will be in the classroom each day, and out in the field at different locations each night. While in the field, instructors will demonstrate their own techniques, and work with participants one-on-one to make sure everyone gets the most out of the workshop. During classroom sessions, there will be presentations by instructors, but we will focus on developing your images and sharing everyone’s work and ideas with one another. Each day will include a review of the previous night’s work. You are responsible for your airfare and car rental. There is no need for four-wheel-drive or high-clearance vehicles for the workshop. (However, please note that if you plan to travel to the backcountry area of Cathedral Valley before or after the workshop, whether on your own or part of our add-on night, you will need to rent a high-clearance 4WD vehicle.) If you are interested in sharing a car rental, let us know and we will try to connect you with someone like-minded in the group. We wholeheartedly encourage carpooling! The workshop will be based out of Torrey, Utah. You are not required to stay at the official workshop hotel, though doing so does make it easier to meet with the group each morning. Booking info and a group code will be sent after registering. It’s summer in Utah. It will be hot, but dry. The average high is 87 F and low 58 F. It can reach as high at 103 F and as low as 35 F. So plan accordingly and check the weather while packing for your trip. Recommended attire: We’ll be spending much of the daytime at the hotel with some late afternoons in the park, so we’ll avoid the greatest heat. Wearing long pants is advisable, but shorts and a T-shirt are great too—especially if you bring some light layers to add as the evening draws on. No vigorous activity will be required, but please consider your physical abilities in hot weather prior to registering. There will not be any long hikes, but you should be comfortable carrying your own equipment over uneven ground in the dark. I had the pleasure of spending time in Capitol Reef with Chris and Gabe in 2016. One thing that immediately struck me was the sheer scale of the park. It’s pretty wide West to East, but that is nothing when you compare to how large it is along the Waterpocket Fold North to South. If you are attracted to geology, you’ll love seeing the tilted strata of sedimentary deposits. My Dad taught me a lot about earth sciences when I was young, so I look for and enjoy good geological formations and features. And Capitol Reef has them in spades. I was amazed by the variety contained within the park easily viewed from the roadside pull-offs on Route 24. Massive cliffs like Chimney Rock, Mummy Cliff and those seen along the entire drive are a trip through time itself. Where there is water, there is life. And in Fruita, we experienced the lush orchards, Cottonwood trees and some delicious pie from the Gifford Homestead Store. My mouth waters just remembering it. We travelled the aptly named Scenic Drive to Capitol Gorge. The pavement ends and a primitive road leads at the bottom of towering gorge walls, eventually ending at a parking lot where you can continue on foot down through Capitol Narrows to the Water Tanks and the Golden Throne. It’s hard to describe how remote it feels to be there. Alien. I imagined as we walked that cell phones and technology really have no place. It was nature in its most brutal and beautiful form. A quintessence of only the hardiest materials, flora and fauna. 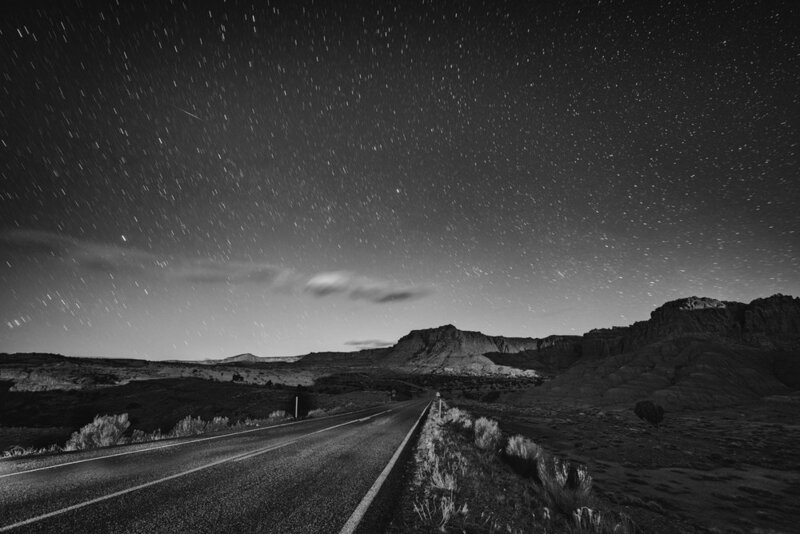 Add to this inky black skies, brilliant stars winking in the dusty air, and moonlight crafting and shaping the contours and angles of the landscape. It’s an amalgam for fascination, and an opportunity to show your appreciation by making your own photographic art blending all of these elements together. I am drawn to the deserts of Utah again and again for all of these reasons. I hope to see you there. Come join us.